Tendons are bands of fibrous tissue that connect muscles to bone. When a muscle contracts, the tendon pulls the bone, causing it to move. The movement of the fingers is controlled by muscles in the forearm. Tendons attached to these muscles run through the wrist and help the fingers to move. Extensor tendons present on top of the hand help with straightening the fingers, while flexor tendons that lie on the palm-side of the hand help in bending the fingers. Deep lacerations on the under surface of the wrist, hand or fingers can cut, and injure these flexor tendons, making it difficult to bend your fingers. Injuries to the flexor tendon can also occur during sports activities (football, rugby and wrestling), when the tendon may get stretched and pulled off the bone or when a player’s finger catches on another’s clothing (Jersey finger). It may also be associated with certain conditions such as rheumatoid arthritis. Flexor tendon tears may be partial or complete. Partial tears allow limited movement, but complete movement of the affected finger is lost in cases of a complete tear. Since they are extended under tension, a complete tear can cause the ends to recoil. You may also experience pain, swelling and numbness (loss of sensation). When you have a deep cut on your hand, immediately apply ice to the injured finger, tightly wrap a sterile cloth or bandage and keep your finger elevated above your heart level to reduce bleeding. Visit your doctor for further evaluation and treatment. Your doctor will review your symptoms and medical history, and perform a physical examination where you will be asked to bend and straighten your fingers. Your fingers will also be checked for sensation, blood flow and strength. An X-ray may be ordered to check for any damage to the surrounding bone. A tetanus injection may be administered. In cases of a partial tear, your hand will be placed in a cast to allow healing. A completely ruptured tendon cannot heal without surgery. The damaged ends of the tendon are brought together with sutures to achieve a secure repair. If the tendon injury is severe, a graft taken from another part of the body, such as a foot or toe, is sutured to the torn flexor tendon. Your surgeon will place your hand in a protective splint to restrict movement and enable healing. Depending on the injury, you will be advised to start hand therapy for a few weeks following surgery. 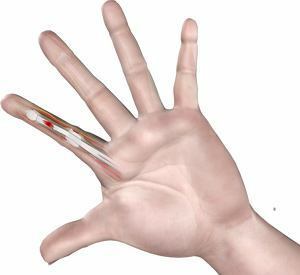 This is to improve the movement of the finger. Make sure to follow your surgeon’s specific instructions for a successful recovery.